Today, Vincent van Gogh is known for his talent as a painter. According to biographers, Vincent showed little creative potential as a child. It’s also noted that Vincent had a “well-respected art teacher” but he didn’t show much creativity as a painter until much later in life. Even so, Vincent continued to draw and eventually decided he wanted to become an artist. Flash-forward 147 years, from the time this black and white photograph was taken, his creative talent is greatly appreciated. With a collection of 2,100 artworks, 860 oil paintings, 1,300 watercolors, prints, drawings, sketches, self portraits, still lifes, landscapes and more, you are bound to fall in love with his work. To better understand Vincent van Gogh’s work, notice each painting deeply and reflect on the following points by writing what comes to mind. Click on the paintings for clues to the questions. In what country can these painting be found on display today? What emotions do these paintings reveal? If you could step into and spend a day inside of one of these paintings, which painting would it be? Explain your choice. Talent: natural abilities or qualities. Oil on Canvas: a painting done in oil paints. The art or practice of painting with oils. Hello Nicolas. What a nice thing to say. I miss your brainy self too. Take care. I will mention your name at ASES. 1.The first painting takes place at a cafe.The second painting takes place in a field.The third painting takes place at a ocean. 2.The Cafe Terrace at night is in Netherlands.The View of Arles flowering Orchards is in Germany.Starry Night is in France. 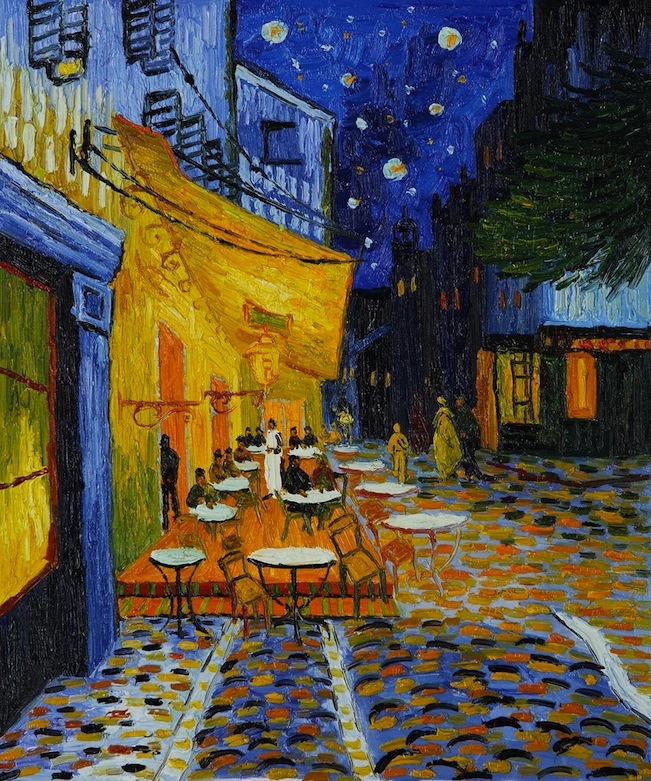 3.This painting,Starry Night makes me feel happy,and calm because their is no one to bug you. 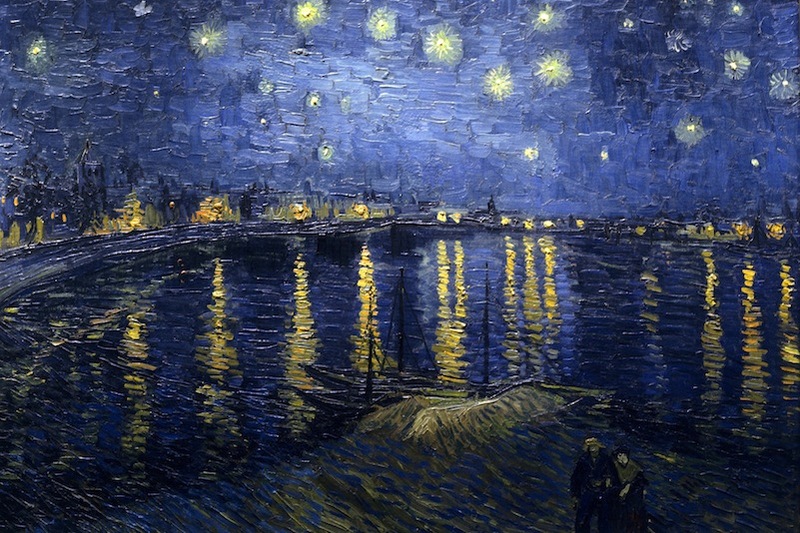 4.If I could spend one day in one of the paintings it will be Starry Night because it will be peaceful. Well said Julian. Thank you for your thoughts. I like that you enjoy art, especially Van Gogh. I would go to the cafe because it is calm and peaceful and i would get coffee. Thanks Dylan for your response. Can you look at #1 again and mention the settings to each of the paintings? 1.I believe Cafe was painted at a cafe,the Flowering Orchards were painted at a field,and the Starry Night was painted at a beach. 2.The countries the paintings are from are…the Cafe is in Netherlands,the Flowering Orchards is in Germany,and the the Starry Night is in France. 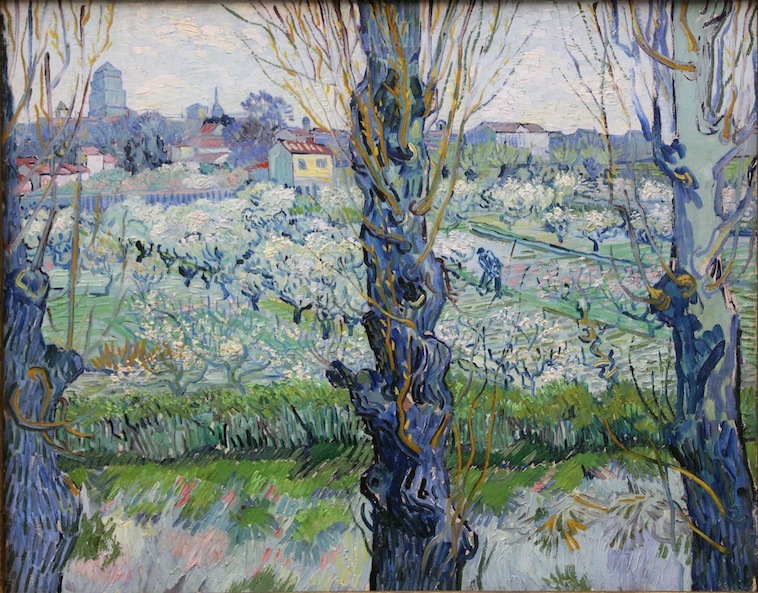 3.The painting,Flowering Orchards makes me feel calm and open because it looks quiet and open. 4.If I could spend a day in one of the paintings I would go into Flowering Orchards because sometimes I want peace and quiet and I would also like to smell the orchards of flowers. Hello Katie. For #2, I believe that it was the current location of the paintings. Where are they on display? Not to be confused with where they are from. 1.Where it takes place is in a cafe,garden,and ocean. 2.The paintings can be found in Netherlands,German,and France. 3.The emotions in the paint reveal at the cafe is happy place.At the flowering orchards I think it’s peaceful.Starry Night is a calm place.The painting I like is the Starry Night because it’s calm and peaceful. 4,The painting I want to be in for a day is the starry night because it is calm and I love the colors. Thank you for your thoughts Danielle. I’m glad you mention that the cafe is a happy place. I believe that this is where people go to relax at the end of a hard working day and have I little cup of coffee with a friend. 4.The cafe because I could have a cup of coffee at the end of my day and I cold also unwind at the end of my day. Thanks Eli for your response. Can you look at #1 again and mention the settings to each of the paintings? 1) I believe the paintings take place in a field, a cafe, and a lake. 2) I believe they can be at Netherlands, Germany, and France. 3) I believe these emotions of the Flowering Orchard is lonely and peaceful. 4) I would go to the Flowering Orchard and fish in the lake and it would be the best day ever. Hi Sam. Thanks for your thoughts. Do you believe people can enjoy being lonely and peaceful at the same time? This sounds like a really cool guy and seems like lots of people like him and his paintings. Well, how about we say that he was an interesting guy? Biographers mention that he was moody because of his health conditions.